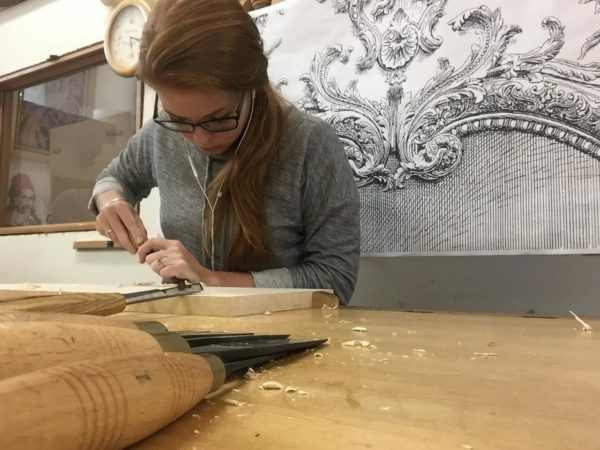 Amanda Doggett and a small group of apprentice joiners were sent by Colonial Williamsburg to study with the master woodcarver, Dimitrios Klitsas at his studio in Hampden, MA. Over a period of two weeks, they endeavored to absorb his lessons, which she boiled down to his dictum, “One olive at a time.” With so much to learn, she said, Dimitrios kept returning to the topic of maintaining focus and remaining patient. Coming from a historical background, Ms. Doggett brings an historical context to studying with Dimitrios.